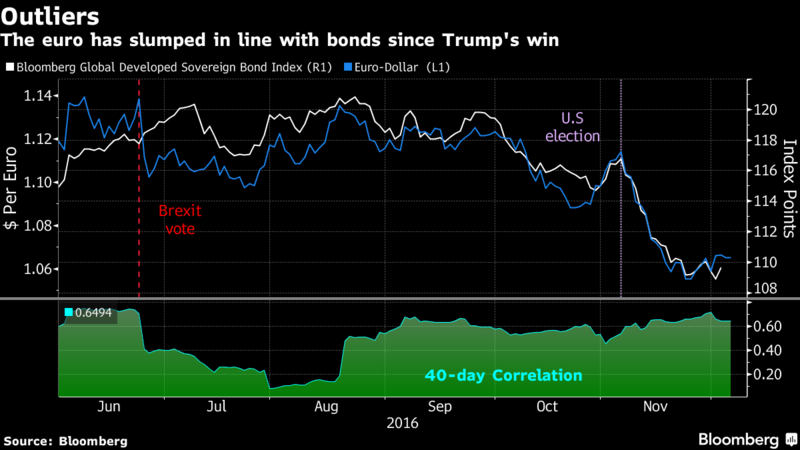 WELLINGTON (Dec 5): The euro retreated with riskier assets, while bonds advanced, amid concern the failure of Italy’s referendum on constitutional reform will destabilize the country, emboldening anti-Europe and nationalist forces. The common currency touched its weakest point in 20 months as Prime Minister Matteo Renzi conceded defeat and said he’ll quit as results showed his bid to overhaul legislative decision-making in Italy had been voted down. Stocks from Tokyo to Sydney declined as the surprise resignation of New Zealand’s premier exacerbated pressure on the local currency. Government debt tracked a rebound in Treasuries from Friday, when mixed US jobs data weighed on the dollar and stocks. Oil retreated from near its best price in 16 months. Renzi’s concession so early on in the vote count coursed through early Monday trading, given the referendum was seen as a vote on the country’s future within Europe. Renzi staked his position on a win for the reforms, which were aimed at simplifying the legislative process in a nation that’s seen 63 governments since the end of World War II. While odds of the Federal Reserve raising interest rates this month remain wedged at 100%, Friday’s divergent American jobs data damped the outlook for successive hikes in 2017. • The euro weakened 0.8% to US$1.0582 ($1.51) as of 9:16 am in Tokyo, paring a slump of as much as 1.5%. • The yen was little changed at 113.66 per dollar. • The kiwi weakened 0.8% to 70.83 US cents as Prime Minister John Key, a former currency trader, said he’ll stand down and backed Finance Minister Bill English to succeed him. • The Bloomberg Dollar Spot Index, a gauge of the greenback against 10 major peers, jumped 0.5% after falling 0.3% on Friday, capping its first weekly retreat since the US election delivered Donald Trump the presidency. • The greenback has climbed since Trump’s win on speculation he’ll stoke economic growth by ramping up fiscal stimulus. • US employers added 178,000 workers to payrolls last month, after rising by a revised 142,000 people in October, and the jobless rate slid to a nine-year low. Hourly wages declined for the first time since the end of 2014. • Yields on Australian government debt due in a decade snapped a four-day climb, slipping by eight basis points, or 0.08%age point, to 2.78%. • Similar maturity New Zealand notes yielded 3.21%, down seven basis points. • Ten-year Treasury yields fell another three basis points to 2.36% after losing seven basis points on Friday. • The MSCI Asia Pacific Index declined 0.4%, with Japan’s Topix index retreating 0.6%, Australia’s S&P/ASX 200 Index down 0.7%, the Kospi losing 0.4% in Seoul and New Zealand’s S&P/NZX 50 Index dropping 0.3%. • Futures on the S&P 500 Index decreased by 0.4% after the underlying benchmark ended Friday up less than 0.1% after paring an advance of as much as 0.3%.